I am now a big fan of the tunas. I used to want one but stuck with the regular vintagey pieces like the MM300. The tunas were a bit too much for me as a casual watch, too big. I bought one but then quickly sold it, although the interest was still there. That all changed when I started using them for what they were designed for - diving. Now I won't leave for a trip without one as a backup to my dive computer. It becomes a great beach watch but it's really in its element in the water. The Darth Tuna started out as the SBBN011, then got a signed crown and some extra writing and became the SBBN013. With Basel 2015, it now becomes the SBBN025 but the changes are much greater. 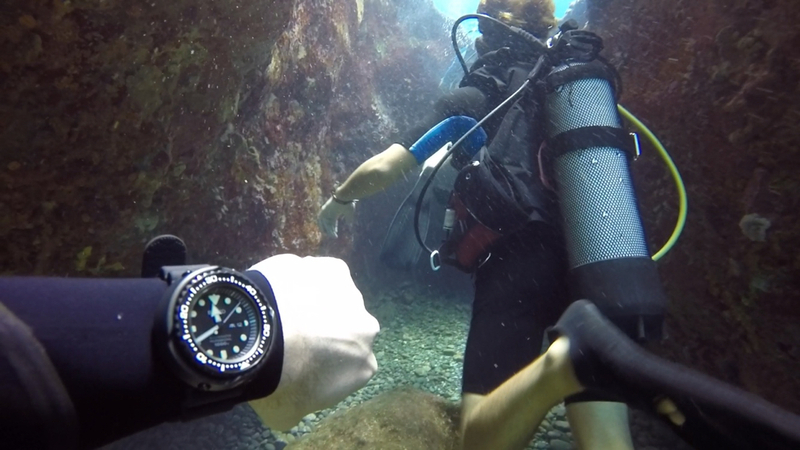 At first I saw no reason to replace my SBBN013 (2nd one I owned) with the new model, but because I'm a sucker for Seikos I eventually did just that, in time for a recent dive trip. The biggest change is the hand design. They went from a large minute and smallish hour hand in brushed metal to the white tipped, or rather, black based, plain minute and large arrow hour hands. At first I hated this change, and this is what kept me from getting the spring drive tuna. Well, with Basel 2015 this has become the standard hand design across most of the tunas, and it slowly grew on me. One other thing that bothered me was the old Darth had a nice long seconds hand base, and the lume ball could almost act like the real seconds hand. Well, on this new model that got a lot shorter and the hand tip is now white instead of bare metal. These two things added up to annoyances in photos but in real life use I really like the changes. What's funny is that even in this post I'm torn between the photos of the old vs new, but in real life the new one to me is much nicer. The seconds hand I still wish was longer, but I like the white tip better. The lume on the new model is also unbelievable and something that needs to be experienced first hand. 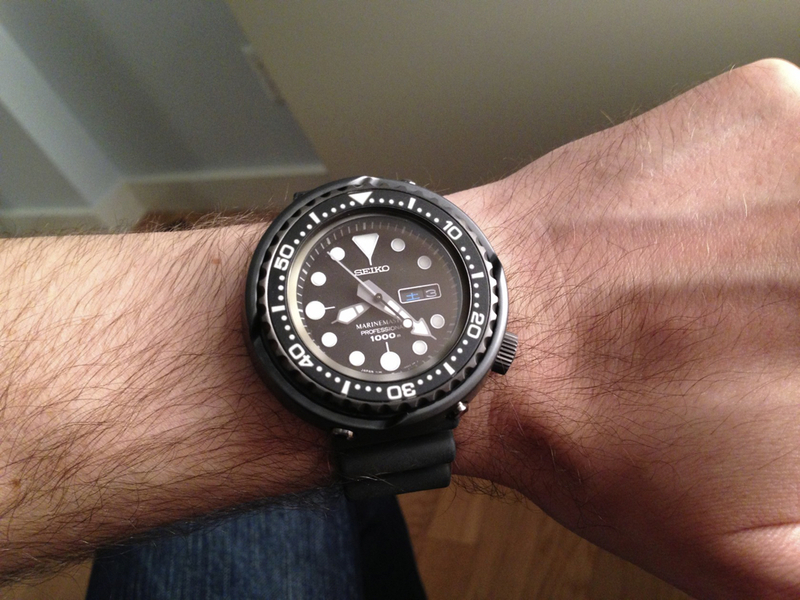 Kudos to the Seiko engineers for coming up with this. The other nice touch is that although the movement is the same, with the same date wheel, the dial design has been updated. The watch has an overall much cleaner look, with no line surrounding the date, no outline to the markers, and now has lume at 3. In the dark the watch becomes clearer to read, and in daylight as well because the date disappears until you look at it. Aside from these changes, which I think are quite a lot compared to the 11 to 13 changes, the watch has the same movement and performs the same. Mine has been dead on since I got it a few weeks ago, and it has already been baptized in the Caribbean waters. If you have been thinking about one of the new Basel releases go for it, you will be amazed by the new lume! 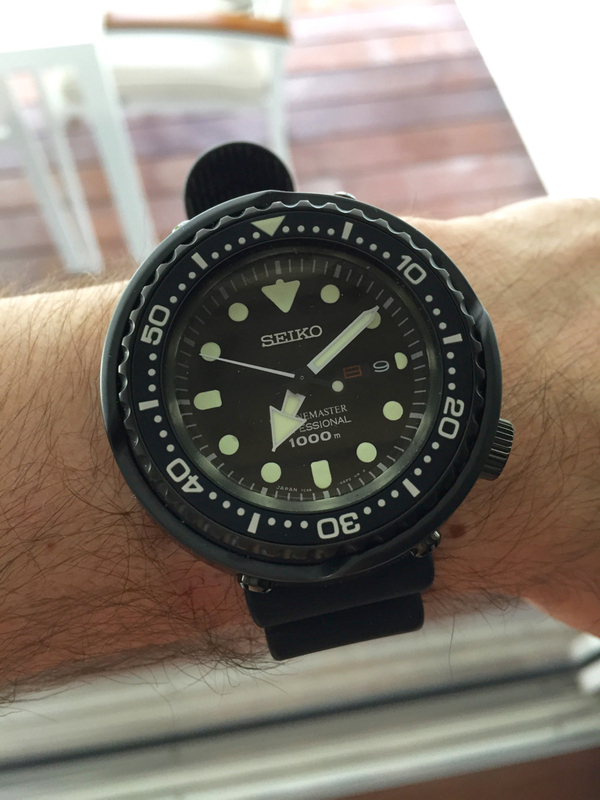 Next Topic: Help needed: who knows this Seiko? !